IJCNCS wishes all authors, reviewers, editorial board members and readers and all their family members a Merry Christmas and Happy New Year 2017. Merry Christmas, all authors, reviewers, editorial board members and readers 2016. Merry Christmas, all authors, reviewers, editorial board members and readers ... We wish you and your family a happy and healthy 2015. IJCNCS wishes all authors, reviewers, editorial board members and readers and all their family members a Merry Christmas and Happy New Year 2014.
International Journal of Computer Networks and Communications Security (IJCNCS) with E-ISSN: 2308-9830 (Online) / ISSN: 2410-0595 (Print) has been established since 2013. This journal is a peer-reviewed, open access journal that publishes original research articles as well as review articles in all areas of Computer Networks and Communication Security. This journal financed by Dorma Journals Publication. The goal of this journal is to bring together researchers and practitioners from academia and industry to focus on understanding Modern security threats and countermeasures, and establishing new collaborations in these areas. 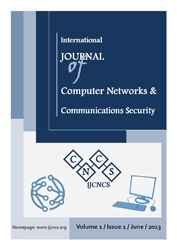 IJCNCS publishes original research works and review articles in all areas of the computer science including computer networks, communications, Security, telecommunications and its applications for wired and wireless networks. IJCNCS mainly focuses and prefers papers with successful practical work, comprehensible description, and clear framework for mathematical modeling and algorithm. IJCNCS provides a challenging forum for academic, scientists and industrial professionals to discuss recent progress in the area of future generation communication, information security and networking. The topics covered by this journal include, but not limited to, the following topics: click to see Topics. Authors are invited to submit papers through (Online Submission) or e-mail at editor@ijcncs.org. Submissions must be original and should not have been published previously or be under consideration for publication while being evaluated for this journal. It is informed to all the authors that paper cannot be withdrawn at any condition once it is accepted. The Publishing Team of IJCNCS suggest you, do not submit same article to the multiple journals simultaneously. This may create a problem for you. Please wait for review report which will take maximum 2 weeks. Paper must be in IJCNCS format.